Toor dal contains folic acid, an important vitamin for all women, especially those planning to become pregnant. Folic acid is essential for fetal development and can help to prevent neural tube birth defects such as spina bifida. Getting adequate amounts of folic acid in your diet can help to reduce specific brain and spinal cord birth defects by more than 70 percent, according to the New York State Department of Health. The United States Department of Agriculture notes that beans and peas such as toor dal can be counted in both the protein and vegetable subgroups of the government's healthy eating plan. This is because legumes such as toor dal are an excellent source of nutrients and plant protein, and they also contain dietary fiber. In essence, legumes are nutritionally similar to poultry, meat and fish, though they represent a low-fat and low-cholesterol alternative. 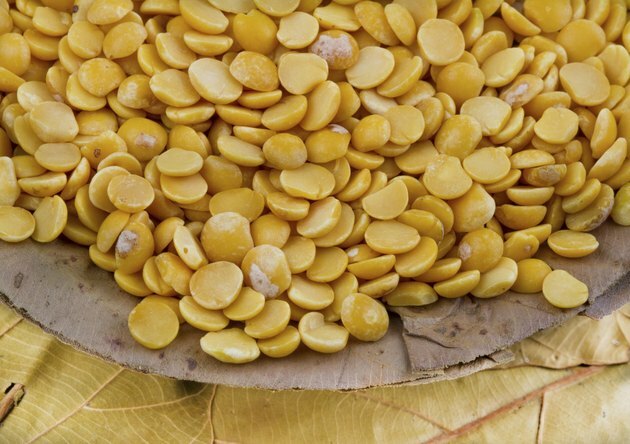 Legumes such as toor dal provide essential nutrients, fiber and protein for vegetarians as well as those who wish to merely limit their meat consumption. Toor dal is also an excellent source of carbohydrates, which your body needs for energy. When you eat food containing carbohydrates, your body breaks them down into glucose, or blood sugar. Blood sugar is then used to provide energy to your brain, body and nervous system. Unlike simple carbohydrates, which contain processed and refined sugars with little nutrition, legumes such as toor dal contain complex carbohydrates. Complex carbohydrates are recommended over simple carbohydrates because of their increased nutritional value. Legumes such as toor dal are a healthy source of dietary fiber, which can help to prevent constipation and promote regularity. A diet that includes healthy dietary fiber can also reduce your risk of chronic diseases. Regularly eating legumes as part of an overall healthy diet can lead to a lower risk of heart disease, stroke, certain cancers, type 2 diabetes and cardiovascular disease.